← The Wild Tiger Birthday on February 17th! Hello guys, long time no see! This month’s Pash! and Animage had interviews with the director of the upcoming Tiger&Bunny movie, so I decided to translate them for your reading pleasure. Q: Tell us about the progress you’re making on the movie. Yonetani: The storyboard is ready and we’re almost done with the recording for the movie. It’s gonna get harder from now on, but the staff members are doing their best. In the previous movie, we did the scenes with people by hand, but this time, we’re also using CG and testing out many different technological tricks. Q: How did you create the story for the new movie? Yonetani: We were discussing the story during several meetings that could take over 10 hours, steadily improving the script and the direction of the plot – there were 11 drafts total. Even after that of course we were still adding some small improvements here and there. We tried to polish the composition of the whole movie, so the viewers can watch the movie and think “Ah, so that’s why they went with “Rising” for the title!”. Kotetsu’s powers got reduced significantly to just one minute, which I think you can feel also when looking at the visuals, showing the Wild Tiger standing still in the twilight. Will Kotetsu sink together with the light of the evening? What will happen when the new character, bright like a golden sun, rises in the world of our heroes? We tried to pack many meanings of “The Rising” into the movie, so I encourage everyone to pay attention to them. Q: Tell us something about Ryan, what kind of a character is he? 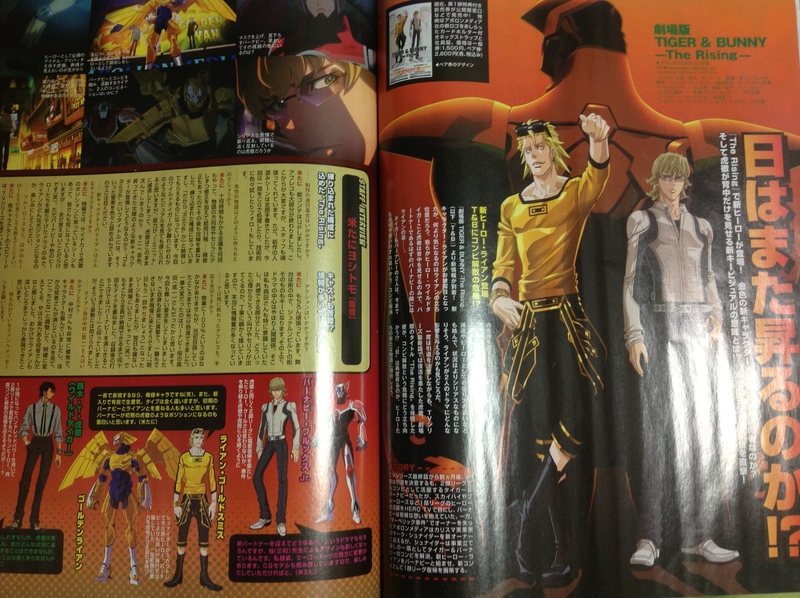 Yonetani: There was a scene in one of the trailers that shown him riding together with Barnaby, taking Kotetsu’s place. I think everyone was pretty shocked by it… But I still can’t say anything about our new hero! (laughs) Look forward to what position Ryan will take in the drama that our heroes will be delving into. Q: Tell us something about other heroes like Blue Rose. Yonetani: In the TV series, we experienced the episodes featuring the other heroes, which helped create a convincing world. I believe you can feel that other heroes are indeed indispensable in this movie as well, so we did our best to show their depth – and we’ll be happy if thanks to that the viewers think about what our keyword, “Rising”, means for each of the characters. Yonetani: We’re doing our best to make them look good. The movie takes place inside the city, and Sternbild itself will be the “key” this time. What’s more, the center of the drama will be, again, the human relationships. Nishida and I paid great attention to them, it’s one of these parts we could relate to. “What state of mind has a character who says or yells something like this?” – we tried to polish everything to the tiniest detail, so I believe there’ll be a lot of information to take in on one go. Q: Tell us about the voiceover sessions that ended recently. How were they? Yonetani: I can’t say everything got 100% done, but we reached all the basic goals we had for this session. I think Morita Masakazu, the voice of Barnaby, had it the hardest. This time again we demanded a lot from him, but he took his work very seriously. He didn’t get any sleep the day before the recordings, and yet, asked us to repeat some scenes the next day. Then the following night he again didn’t sleep at all (laughs). That’s how we re-took many scenes until we were satisfied. After we were done, he exclaimed that yay, he managed to play Barnaby again! His attitude really helped us a lot. Q: How about Nakamura (Yuuichi) who plays Ryan? Yonetani: Nakamura is a great actor. I think he captured Ryan’s personality well, and defined and improved many of his lines by watching other actors play. I thought he’s got a lot of talent. I think thanks to him we managed to get across the depth of Ryan’s character. Q: Please, give the fans eagerly awaiting the movie a message from yourself. Yonetani: I’m sorry for making everyone impatient (laughs), but the whole staff is putting their souls into making the movie. There are so many elements we want to include, and we’re doing our best to present them all in the best way we can, so please, wait just a little bit longer. Thank you for your patience! – The previous movie, “The Beginning”, was, like the title suggests, a story about the “beginning”, but the second movie isn’t aiming to present an “ending” to things. “The Rising” shows a struggle of the heroes who are searching for a way to overcome the darkness of the night and reach for the light of the dawn. – Morita and the sound director didn’t get any sleep at all during the recordings, and Morita was apparently full of enthusiasm, throwing lines like “Shouldn’t it be like this”?”, “Or maybe we should try it this way?”, “You know what, let’s record it again!”. “What is wrong with you guys! ?” was what the director thought when looking at their dedication. – The staff is doing their best to create a movie that will please both the fans and the people who will just go see it in a cinema. Note: the heroes’ voice recordings for the movie ended on the 7th July. This movie sounds so intense! I can’t wait until it comes out! I’ll be on the edge of my seat, watching the whole thing! Thank you for sharing this information :). I’m looking forward to this movie! Where does Morita get his energy from if he didn’t get any sleep?! XD Thank you for sharing! Can’t wait to watch the movie! Thanks a million for posting this translation!